Can you talk about the origin of the title of the show, As A Shadow Smiles? Christopher Garrett came up with that title. 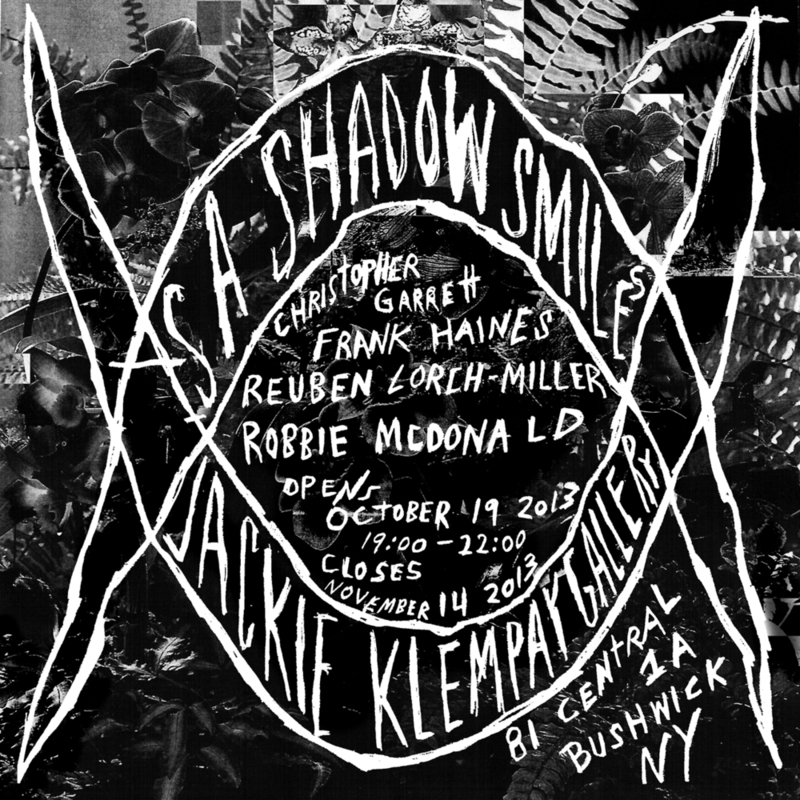 It's an extension of a title Frank proposed: Shadow Smiles. I'm not sure about the origin exactly, but my thinking is that it has to do with something that emerges from the dark or the shadow side. Like seeing a smile in the dark, a signal from hidden realms. In Jungian psychology there is the concept of the Shadow, which is something we all carry as part of ourselves. It is the part of our identity that carries all repressed emotions, desires, fears, etc. It’s our dark cobwebby psychic closet. It shows itself either consciously or unconsciously, either way it eventually will show itself. At some point in life, we are forced to meet it face to face and we can either greet it and learn from it or fight it and force it back into the dark corners to come back another day. Meeting it and consciously and lovingly working with it is a more healthy way of integrating it into life. As for a smile, it can be a very ambiguous facial expression. It can be knowing, friendly, welcoming yet also menacing or sinister. For this show, I'd say it is more on the friendly and welcoming end, of course with a touch of darkness, because that is who we are. This exhibit weaves together the work of four artists. I understand that the process of installing this show was very collaborative. Can you talk about that process? It all happened very fast, which was good in that we couldn't get too hung up on decision making and overthinking things. We had to use a lot of intuition. I'd say that we are all pretty ambitious and also sensitive to objects and arrangement in space. As a group of friends, there is also a lot of trust and common points of reference between us all. In that atmosphere, we were able to really collaborate in the effort of putting the show together. All that energy was transferred into the look and feel of the exhibition. Frank and Jackie worked out the initial idea. Frank had some ideas going from some past group shows he had put together. Some of those ideas came into this show, like painting the walls grey for instance. Jackie did studio visits and we established anchor pieces for each artist that we knew would set the foundation for the show. We all brought more work with the idea that we would see how it worked out and fit together. It was all very collaborative and fluid. It was also very influenced by being adaptive and inspired by Jackie's space. Can you talk about Jackie Klempay Gallery, and how the unconventional space influenced the installation and experience of the work in this exhibit? Jackie runs her gallery out of an apartment. The gallery takes over most of the space. The space is really influential if you let it be. This was a big factor in how we hung the show. It seems like there are two options, work with it or against it. We worked with it and made a lot of subtle decisions based on how we were informed by the space. Also, she has a beautiful big back yard, which initially we only loosely discussed using. In the end, it was a major space for the exhibition. It is half the exhibition space and became a really strong and effective component. I feel like we really pushed the space, but also worked in harmony with it. It's a space that at first could seem small, but when you really start working with it, it has huge potential. A lot can be done with wall color and lighting and working from floor to ceiling. Again, a lot of the decisions were adaptive and intuitive. Jackie is really a great curator and facilitator, in that she is really open to experimenting and trying different strategies on how to expand the use of the space. She was very encouraging of our ideas. A lot of "Go for it." and "Try it". Again, it was a really trustful environment. What are the common conceptual and formal approaches that you saw emerge among the work as the show came together? When I was looking at the show the other day, I saw a lot of formal connections. It's like each work touches the other to work on a grid or network of common points. It could be color or patterning or feeling or form. I've walked through the show with a few people and they weren't sure who made what and where the boundaries were. I think that is really great. Also, the way the show is hung there is a lot of visual overlap. It's not organized by sections necessarily, but more as a visual whole, where you will see one artist in spatial and visual context to others. There are also a few pieces that really have no explicit authorship, but act more like collaborative gestures of placement. I'm thinking about the crystal ball, the skull mug and the photocopy in the kitchen. I'd say generally, there are common ideas that something is hidden or embedded within each piece, that there is a code or mystery within each piece or body of work. Each piece relies on a structure or set of beliefs. Some are more explicit than others, but generally each work is a mystery. A mystery in the shadows and signals from hidden realms. Also, given the way the show is hung, it potentially becomes this larger correlation of ideas. It’s never defined as it is fluid and multifaceted and folds back in on itself as it simultaneously expands, but it is there. The feeling of presence and energy is there. Can you talk about your interest in ritual objects and artifacts in relation to your ceramics and collage work in the show? The ceramic sculptures are like artifacts. They have a rigidity or simple structure to them yet are some how broken down or effected by entropic forces. They are made by being buried in a pit fire and fired for a couple of days under extreme conditions. I wanted to make these things that are both human and alien simultaneously, familiar and unfamiliar. I wanted them to be both slightly technological yet ancient. Inspiration for them comes from architecture, ritual objects, archeological finds, pottery shards, space junk, science fiction, minimalism. 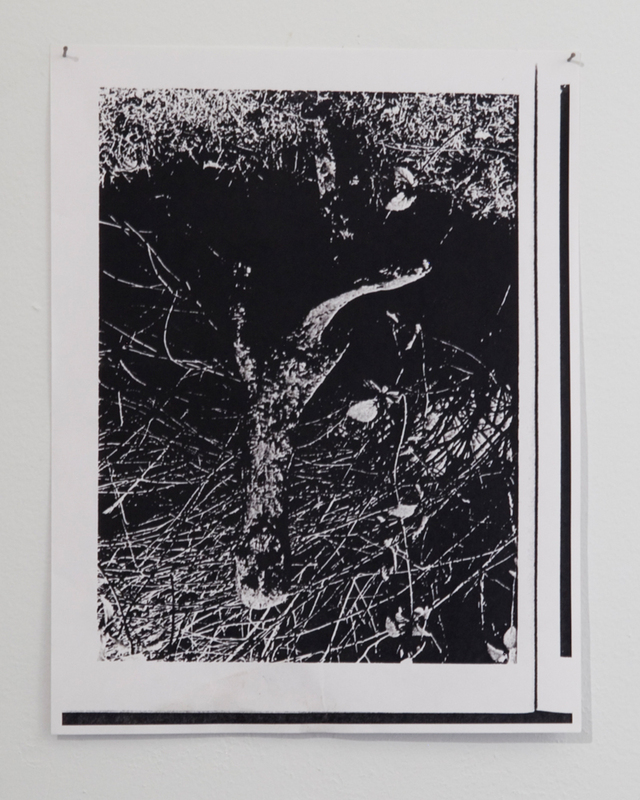 The collages are made out of black and white photocopies. They are from photos I've taken then made into photocopies. For this show, I made one that is titled “First Cairn”. A Cairn is a man made pile or stack of stones. It can to mark a sacred site, a tomb or act as a marker for a path. I have made other collages that are of imagined objects and places (sort of psychological landscapes). I think of the collages as sort of like mapping or picturing places or marking a path. They come from dreams. Locations and objects visualized in dreams. Ultimately, the sculptures can be seen as markers along a path too.